Northern red oak leaves severely distorted due to frost damage. 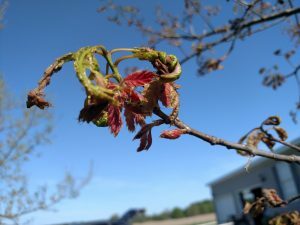 A late frost severely impacted newly emerging oak leaves in many northeast Wisconsin counties including Brown, Outagamie, Oconto, and Shawano. Due to the development stage, oaks were the most heavily impacted compared to other species, and oaks in the open were more severely impacted than oaks in forests. Many oaks in open areas had to send out additional leaves, which were then tattered by strong storms that pelted them with heavy rain, hail, and strong winds. Oak leaves in the counties mentioned may look a little rough for the remainder of this year. 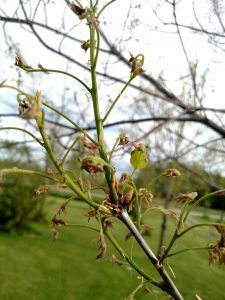 The late frost also contributed to damage on ash leaflets, which, in addition to early anthracnose infections on the leaflets has caused ash in some northeastern counties to drop their damaged leaflets, leaving them mostly bare. They will send out additional leaves to get them through the summer. Northern red oak leaves tree severely defoliated due to a late frost event. Photo taken May 29, 2017 (same tree as other pics in this article). 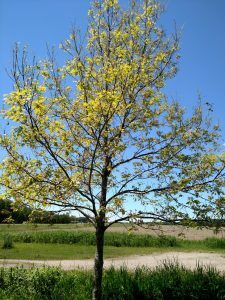 Northern red oak sending out new leaves due to severe defoliation from a late frost event. 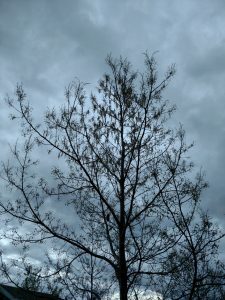 Photo taken June 2, 2017 (same tree as other pics in this article). Northern red oak leaves refoliating following a severe frost event. Photo taken June 7, 2017 (same tree as other pics in this article). 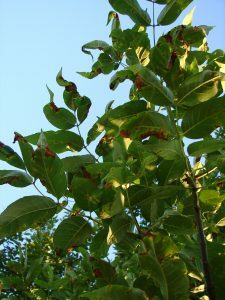 Ash leaflets damaged by anthracnose may be dropped by the tree.